Heartfelt thanks to the cast and crew of “Disney’s Beauty and the Beast” for taking us out of the reality of what has happened outside of the Broward Center for the Performing Arts in Fort Lauderdale this past week. Instead they took us into a world of fantasy, fairy tales, singing, dancing and talking teapots, clocks, loving fathers, egotistical and funny suitors, beasts who turn into princes, spells, roses and love. This production seemed to move at a faster clip than previously and the actors got laugh after laugh even wringing some from jokes, and moves, we have seen numerous times. 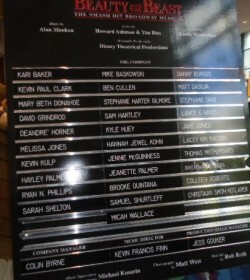 The beast, played by Sam Hartley, was the funniest beast yet as he interacted with Lumiere, the living candelabra played with expertise by Ryan N. Phillips, and the clock, played by Samuel Shirtluff, hitting every beat and at the same time touched our hearts as he found love with sweet, lovable Belle, played by Brooke Quintana. Babbette, played by Melissa Jones, Mrs. Potts played by Stephanie Gray, with a little help from Chip, an adorable Deandre’ Horner and Stephanie Harter Gilmore as Madame de la Grande Bouche couldn’t have brought more to their characters and the audience ate them up. Jeanette Palmer, Colleen Roberts and Sarah Shelton, as the Silly Girls, could and should get an act together and play in nightclubs they were so coordinated working together. Christiaan Smith-Kotlarek as Gaston, made being vain, narcissist and ultra masculine pure camp milking every line for a laugh and getting them while as Matt Dasliva, his sidekick, Lefou, took so many tumbles and pratfalls it’s as if he is one big rubber band. 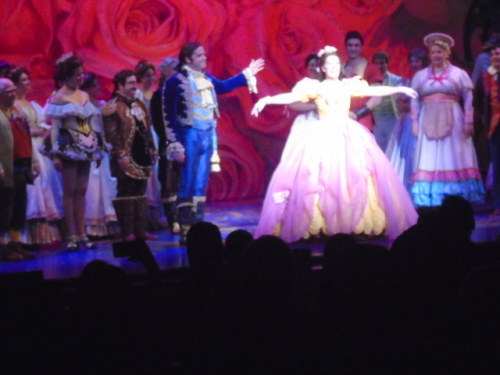 The ensemble of dancers and singers, along with the above, made show stoppers out of “Be My Guest”, “Human Again”, the title tune “Beauty and the Beast” as if they were being heard for the first time. The rest of the score by Alan Menken, Howard Ashman and Tim Rice, under conductor Kevin Francis guiding 10 musicians was the icing on the cake. Almost as much fun was watching the princesses in the audience, many dressed with tiaras and almost gowns, as they watched Belle with fascination while the princes, not as many, were caught up in the magic that was taking place on stage whether it was the beast turning into the prince or seeing plates, spoons, knives and dishes dancing! Thank you to Broadway Across America, Bank of America, NETworks Presentations LLC, Florida Theatrical association and Disney productions for giving us 2 hours and 10 minutes of musical theatre magic at a time when it is certainly needed. “Beauty and the Beast” was the last presentation of the 2015-2016 season and makes us look forward to the start of the 2016-2017 season!